Who, among aviation buffs and action fans the world over, could ever forget the exciting scenes of fighter jock icy-calm bravado as pilots repeatedly push their aircraft to the limits in such classic movies as ‘TOP GUN’ and ‘THE RIGHT STUFF?’ Watching those stirring adventures in the wild blue yonder is guaranteed to shoot a Sidewinder missile thrill down the spine of the true fighter movie aficionado. Of all the ‘tools’ used by the military pilot, perhaps the most glamorous of them all (to the wannabe Tom Cruise) is the flight helmet. Just as in the medieval era, when a knight’s ornately decorated helmet summarily symbolized all of those chivalrous qualities that ennobled him as a fearless fighting man, the protective helmet an aviator wears, visibly sums him up as a card-carrying member of an elite group of fliers. Each flight helmet visually tells a unique story about the special requirements for pilot safety and protection modern high-performance military aviation has demanded over the years, as the technology of military aviation has continued to advance in quantum leaps. In the early years of the 1900s through the end of the Second World War, the aviator’s helmet was made of soft (frequently insulated) leather and was intended purely to protect him from the effects of wind and cold. As advances in wireless radio communications developed, the basic leather helmet began to feature earphones for radio receiver headsets; still later, as turbo charging technology permitted higher aircraft operating altitudes, oxygen delivery devices became standard as well. Early eye protection in the form of rubber-framed glass goggles were adopted virtually from the fledgling days of manned flight as the most reasonable way to protect the eyes, especially in the old open-cockpit machines. 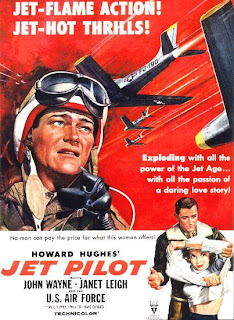 With the higher speeds and altitudes permitted by jet engine powered aircraft, more thought began to be given to sparing the pilot from the potential hazards resulting from the substantially increased inertial forces encountered in high-speed jet turbine powered flight. And as the potential for buffeting in jet aircraft cockpits became known, American researchers’ thoughts focused on devising some sort of enhanced protective headgear to protect the contracted civilian flight test pilots who were evaluating the new jets at such secret testing sites as Muroc Field, in the Mojave desert. The result was a number of what are now called ‘transitional’ helmet designs. 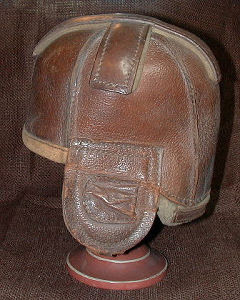 These were typically constructed by private aircraft company personnel for their own use and typically incorporated some form of hard protective hemispherical crown attached to the upper hemisphere of the standard soft fabric or leather flight helmet. Examples known to have existed and been used were made from old leather football helmets, phenolic resin miners’ helmets, pith horse polo helmets, and even cork-lined vintage race-car driving helmets. 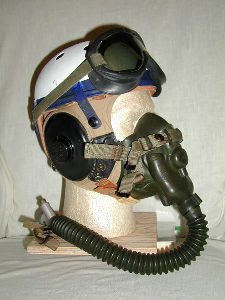 One such design became known as the “Tanker” interim helmet, which used the compressed fiber top half of the US Army M-1 leather tanker helmet attached to a standard USAAF ANH-15 or A-10A fabric flight helmet; this helmet was used briefly by early USAAF Lockheed P-80 Shooting Star crews in 1946 and 1947. Even as this ‘transitional’ helmet was finding application in the first production USAAF jet, research on hard protective helmets was being conducted by the Air Force’s Wright Patterson Aero Lab and Northrop Aviation’s Dr. Charles Lombard. Changes in helmet communications system components (earphones, com cords, and connectors) continued to be made throughout the 1949 to 1960 period. One especially interesting concept developed in the 60s period was the so-called 'clam-shell' design. 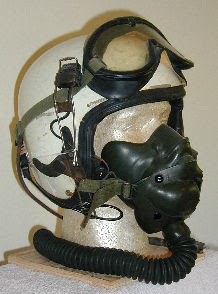 Technically known as the US Air Force HGU-15/P 'Windblast Helmet' (USAF version) and the US Navy AOH-1 / HGU-20/P (US Navy version), and developed as an integrated head protective unit with oxygen breathing system built in, the 'clam-shell' featured a two-part shell that opened and shut like a marine bi-valve's shell. 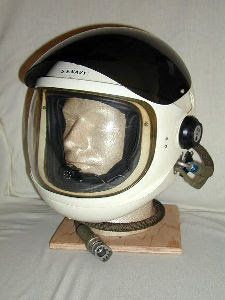 It featured a swivel actuated face visor, with separate articulated sun shade, it looked very much like the conventional pressure helmet used during this time (viz. the Navy's Mk. IV full pressure helmet assembly of the early 60s). While the windblast protection afforded by the whole-head encasing clam-shell helmet design in emergency high speed ejection was excellent (it was intended for principal use in the Air Force’s new Convair F-106 Mach 2 interceptor), there were also aspects of the design that were found to be operationally awkward (especially for high-G air combat situations). These included substantial weight of the assembly (bearing down disagreeably on the wearer's spine in high negative-G maneuvers and turns), fouling of the chin-piece on parachute harness hardware, lack of adequate peripheral fields of vision, and lastly, a tendency to fog up and become opaque.